Saturday w e took a trip to "Buggy Town". 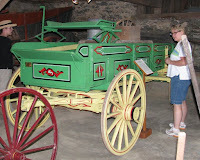 Mifflinburg, PA was home to more than 80 buggy shops in the 19th c. with one, purportedly the only one in the U.S,. 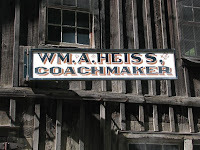 still intact: W. A. Heiss Coachworks. I had hoped to see a collection of carriagemaker planes at the museum, but th ere were none. 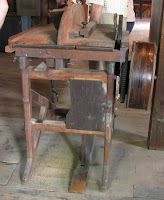 There was, however, the only treadle-powered table saw I had ever seen. It looked homemade with an odd-shaped, adjustable fence and a fixed board in front of the blade whose purpose befuddled me. I suppose it was used as a stop. There were some handsome buggys on display, some with fancy paint jobs. The finishers in the factory were commissioned with the most egregious portion of the assembly, not only because applying the finish was so difficult, but because they had to work in an unventilated room on the second floor of an unheated, unairconditioned, uninsulated, wooden warehouse. They had to keep the windows closed while they worked to prevent dust from settling on the finish. 8-10 hour days/6 days a week. Suddenly, my job doesn't look so bad. 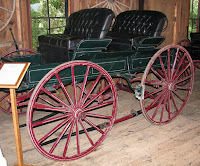 The woods used in the buggys' construction were: poplar and pine for the body; oak for the undercarriage; and hickory for the spokes and wheels. In the last photo, you can see the brake pad pressing against the rear wheel. 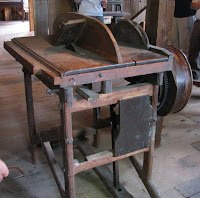 I asked our guide what they were made from and she said anything from wood to fabric to leather to shoes. And that, she said, is where the term "brake shoes" comes from.